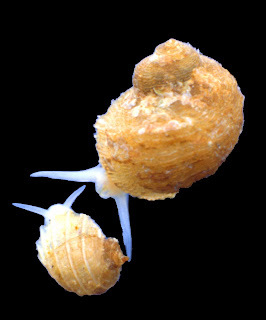 The tiny Mediterranean marine snail Fossarus ambiguus. Photo by A. Piras. I knew this day was coming. Every Monday I assign myself a random taxon to write a post on, and so far I've generally been pretty successful. But I always knew that some day I'd assign myself a target that would prove hopeless. That day has come. The Fossarinae are a group of marine gastropods belonging to the superfamily Cerithioidea that also includes the famous gastropod radiation of Lake Tanganyika in Africa (which, now I think about it, would have probably been a much more promising post subject). As a rule, fossarines are pretty tiny - the best-known species, the Mediterranean Fossarus ambiguus, is only three to five millimetres in size - and they are usually short, squat shells with fairly prominent ribbing. Older references place the fossarines in their own family, Fossaridae, but they were placed in the Planaxidae as a subfamily by Kowalke (1998) (which I haven't read). Fossarines and other Planaxidae (Planaxinae) are fairly distinct in appearance (planaxines are longer and more turret-shaped) but they have similar protoconch morphologies and are both larval brooders. After fertilisation, the female does not lay eggs but incubates her embryos in a pouch behind the head, eventually releasing them as free veliger larvae. One individual of the possible (see later) fossarine Larinopsis turbinata held as many as 400 embryos in its brood pouch. And that is pretty much it, as far as I've been able to find. And to be honest, most of that I lifted off one webpage. Research-wise, Fossarinae seem to have been almost criminally ignored. They don't seem to be particularly rare, and seem to be found pretty much worldwide, so I can only ascribe this to their small size and unassuming natures. Also, as a result of this lack of study, there seems to be an underlying implication that the subfamily is poorly defined and many of the taxa currently regarded as "fossarines" may not be so. One of these doubtful fossarines is this rather neat little shell, Larinopsis ostensus (photo from here). 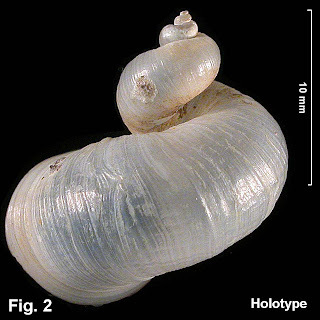 The shell in the photo is the holotype of this species, collected off Jervis Bay in New South Wales, and still the only known specimen. Larinopsis is big for a fossarine (more than three times the size of Fossarus ambiguus) and lacks the prominent ribbing of most fossarines. It also has that very neat loosely coiled shell, so thin that you can see right through it. As already noted, Thiele includes Prisogaster in his subfamily Phasianellinae (which is better regarded as a family), with two other genera, Phasianella and Tricolia. For the latter, Humphrey's name Eutropia must be used, and the family name would become Eutropiidae, but the Neozelanic species does not belong to the genus Eutropia. Pilsbry has pointed out that the small Australian species have a radula of the Phasianellid style, not of the Tricolia (=Eutropia) form. Consequently one may propose for the Neozelanic species the new generic name, Pellax, associating with it the Australian rosea Angas, virgo, Angas, etc. And that is all Finlay has to say about that particular genus. 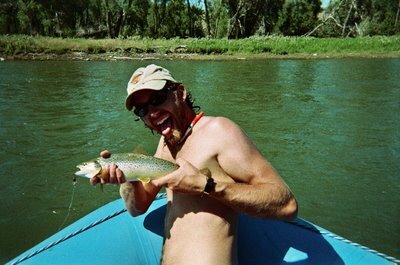 He continues in this manner for 159 pages (excluding references), establishing no less than 177 new taxa in the process. In some places, even a single page is enough to inspire thoughts of suicide in the suffering reader. Finlay, H. J. (1927). A further commentary on New Zealand molluscan systematics. Transactions and Proceedings of the New Zealand Institute 57: 320-485. Kowalke, T. 1998. 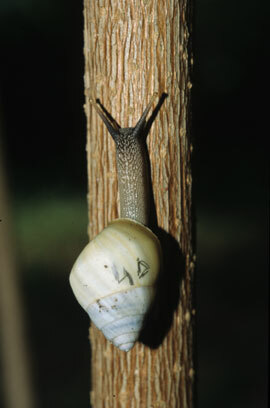 Bewertung protoconchmorphologischer Daten basaler Caenogastropoda (Cerithiimorpha und Littorinimorpha) hinsichtlich ihrer Systematik und Evolution von der Kreide bis rezent. Berliner geowiss. Abh. E, 27: 1–121, 11 Taf., 13 Abb. I hear you about the old taxonomic works. Yet I am drawn to them - like a moth to the flame. I think they seem so obfuscous because they are really just snapshots of ongoing conversations held among the very few people actually working in any of these groups at any one time. There was no rapid communication, and publication was a laborious process - hence, they only put into the printed word their final thoughts about subjects that they argued amongst themselves, back and forth endlessly through letters and at scientific meetings. No need to restate all the background, because the readershipt - their colleagues - were well aware of it. There is something almost vicarious about reading such works - as if you're eavesdropping on a personal conversation but hearing only selected snippets. I agree with you about the small readership being a factor. There were also the smaller numbers of references and species to deal with. Early authors saw no reason to give more specific details for (e.g.) "the rosea of Fabricius' catalogue" when they could assume that all of their readers probably had a copy of Fabricius' catalogue sitting close at hand. For some reason, though, molluscs seem particularly bad in this regard. My suspicion is that it's simply because the high general interest in shells lead to a higher early publication rate on molluscs than most other animals before current writing practices developed. I don't know how much of a factor the relatively high proportion of amateur authors on shells was in this regard, but I'd be interested if anyone else has any idea. Turgid Malacology Conspiracy is my new band. Wish I could turn maximum entropy species specific terrain and local environment prediction into story time like you do. That's what happens when someone spends all their time looking at curly things. I can cope with the pompous prose but the lack of diagnoses give me the irrits. Turgid Malacology Conspiracy When do they debut???!!! You know, I'm glad I'm not the only person who gets "turbid" and "turgid" mixed up.